The FIFA seminar invitation for Patia attest to her hard work and commitment to Football. 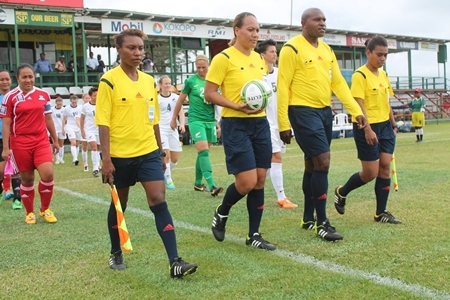 Patia is one of 42 referees from around the world who were invited to participate in the course and she will be joined by Oceania Referees, Anna-Marie Keighley of New Zealand and Finau Vulivuli from Fiji. It is a huge achievement for Patia who will be amongst the top referees in the world who are continuing their preparation programme for the selection process for the FIFA Women’s World Cup in Canada this year. “In refereeing we need to stay focused and not give up hope as opportunities are there for the taking. I would like to encourage more women to try refereeing, knowing there is a pathway to reach big events and ultimately you’re full potential” says Patia. “Refereeing is all about respect. We respect the players and in return they respect us. Anything is possible if you believe in yourself stay committed and focussed, you can reach your dream goals” continues Patia. Patia encourages other eager referees to take up the challenge to pick up the whistle and try out officiating in football tournaments here on Rarotonga. “It is an honour to have our local referee selected to participate in the FIFA Seminar as part of the selection for the FIFA Women’s World Cup and shows the potential our referees can achieve, especially a women from our small nation” said Cook Islands Football Association President, Lee Harmon. The Cook Islands Football Association would like to congratulate Tupou Patia on her achievement and wish her all the best in her Seminar.